All objects radiate electromagnetic energy. 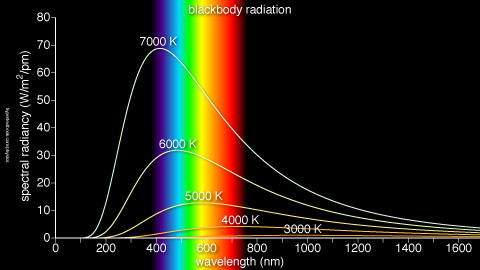 At normal temperatures, the majority of this energy is radiated in the infrared portion of the spectrum, wavelengths longer than can be seen with the eye. The higher the temperature of the object, the more energy it radiates, and the shorter the wavelength. For example, as an electric stove burner heats up it turns orange. The wavelength of the radiation shifts from the infrared (where it is invisible, but can be felt) towards the visible, where we can see at least a portion of the energy emmitted. The total amount of energy emmitted is proportional to the temperature of the object to the fourth power (Stefan-Boltzman law). Plank's equation describes the spectral characteristics of the radiation, giving the radiance as a function of wavelength and temperature. The plot shows how the amount of energy emitted rises with increasing temperature and the wavelength of the radiation shift to short wavelenghths with increasing temperature. One of the most common types of calculations in practical use involves finding the amount of energy an object produces in the band of an IR camera or other sensor. To find the energy available in the waveband of a sensor from an object of a known temperature one would integrate Plank's equation over the wavelength band. It is now trivial to work these equations using a computer or programmable calculator. Prior to the advent of such tools, one would typically rely on either tables and charts from handbooks, or a speciallized calculator slide chart, such as this one made by General Electric. While not the only slide chart for these problems, it was perhaps the most common. The Pickett Model 17 was a "real" slide rule made for doing similar calculations. It was produced for Electo Optical Industries, a manufacturer of infrared test equipment. Rod Lovett has excellent scans of this rule here. In addition to standard C/D scales, the rule provides scales for temperature and wavelength/frequency conversion, and scales for energy calculations in both watts and photons. In the late 1980's, Perrygraph produced an updated version of this rule. The one pictured was sold through the Infrared Information Analysis Center, a military information repository. Judson Infrared, a detector manufacturer, gave a blue version of this rule away as a promotional item. I currently have four of IR rules in my collection. Clear here to view a photo album of these rules.